I've been using Fresh Therapies nail polish remover since last year (review here) and although I'm completely content with it and love the stuff, curiosity got the better of me when I spotted Priti NYC 's Soy Nail Polish Remover and wipes on sale at CutECOsmetics a couple months ago. Priti NYC's polish remover has a subtle lemongrass fragrance and is derived from soy farm crops, without any of the added harsh ingredients common in traditional nail polish remover. Similarly to Fresh Therapies, it's also biodegradable and is even safe enough for children and pregnant women. In terms of performance, it's of a similar standard to the Fresh Therapies remover in the way it takes a little more time to completely remove all your nail polish, but I personally don't find it quite as effective. It's slightly more expensive too at around £10 for 56ml (Fresh Therapies is £8.99 for 50ml) and unfortunately it's not suitable for traveling as it seems to leak if it ends up on it's side. All in all I'm a little disappointed with this nail polish remover in comparison to my all time favourite and I'm glad I only paid half price for it! The nail polish remover wipes on the other hand are a whole other story - I think they're fantastic! They're perfect for travelling (I'll be taking a couple with me on holiday this week) and they're incredibly effective, much more so than any other comparable nail polish remover wipes I've tried. I bought a pack of 10 for £5.98 from CutECOsmetics, although they're out of stock now and I'm not sure if they're available elsewhere in the UK at the moment. I highly recommend these wipes and will definitely be wanting to repurchase some of these for travelling in the future! 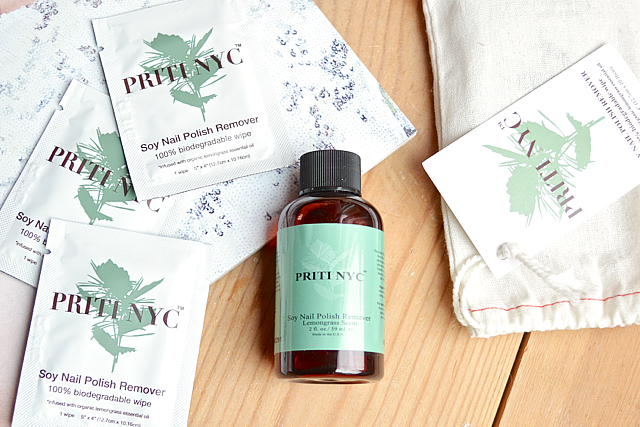 Have you tried Priti NYC's nail polish remover before? I use and love Fresh Therapies but always been curious about the one from Priti, did you know that Fresh Therapies also do wipes? I only use water-based polishes and find the Priti one works brilliantly on removing it. I also got the wipes which I used on holiday and they were perfect for that. Wild Oats in Bristol stock Priti btw.